Call it the day-cation. You arrive at your hotel in the morning and check in. After ordering room service, you take a bubble bath then curl up in a big bed to read a book, watch a movie, nap. Maybe you visit the fitness center or duck out for a stroll around the city. In a pinch you do some work (quiet surroundings, sturdy desk chair). By the time afternoon check-out occurs, you’re relaxed and ready to go home. That’s the idea, or one of them, behind Hotels by Day, a new website and mobile app for iPhones and Androids that serves up hotel rooms in a novel time frame — between 10 a.m. and 6 p.m., the sweet spot when rooms sit unoccupied after early check-out guests depart and before late check ins arrive for the night. The bet is that there’s an untapped market for day stays that cost a fraction of what you’d pay for a night at a hotel in a city or near an airport. 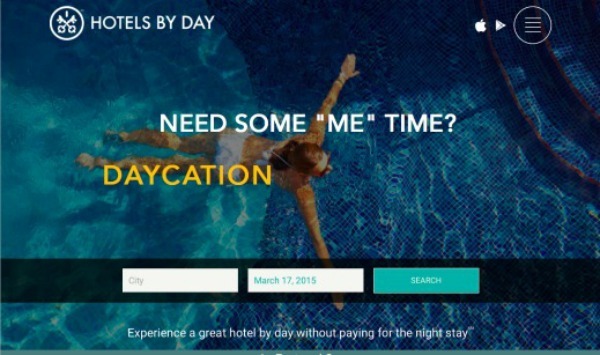 “Hotels haven’t focused on this segment, but we know it exists,” said Hotels by Day founder and CEO Yannis Moati in a phone chat, adding that he saw the potential for day stays during his years as a tour operator. 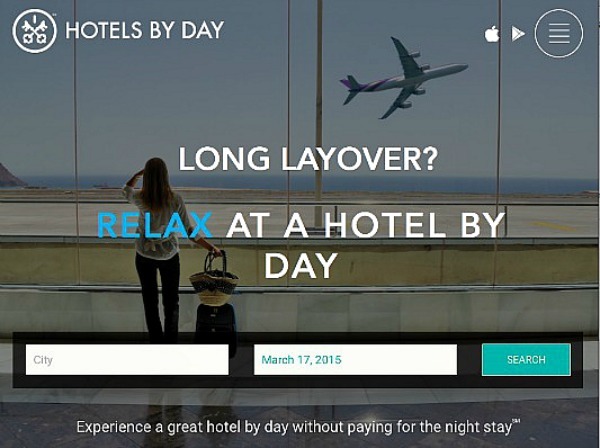 The new site acts as both facilitator and cheerleader for day stays. It displays a range of participating 3-, 4- and 5-star hotels and lists day rates, information and photos for each property. To book, you supply a credit card number to secure the room and click. But the site also pitches the attractions of a hotel day stay — as a place to work for business people, freshen up during a long layover, shower and dress up before a big event or a home base for day tripping families where kids can nap. It can also be an opportunity to experience a hot hotel for a few hours without paying full freight. The idea seems a win/win for the hotels, where an unsold room is a perishable resource. Moati estimates 30 percent of rooms at American hotels go unused. “This gives hotels a second chance to sell them,” he says. For years hotels have quietly made rooms available during the day (consider The Graduate), but this was often a gray area. 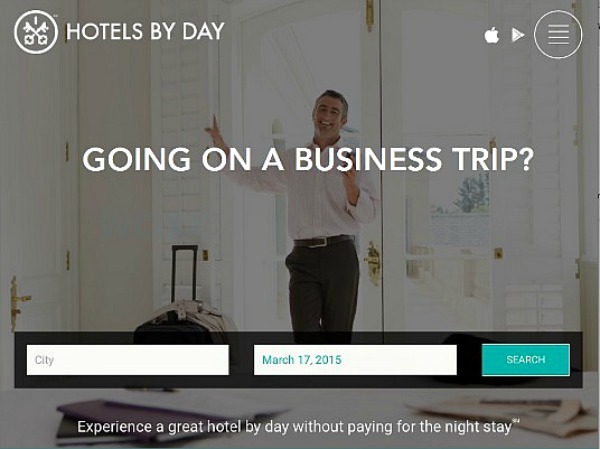 Hotels don’t post day rates on their websites or publicize the practice, in part to avoid any associations with by-the-hour rentals and their illegal activities. Offering rooms exclusively for longer blocks of time, whether for a morning, an afternoon or both, is one way the site hopes to update — and clean up — the idea of day stays. Operating a website that’s well-designed and easy to navigate is another. Road testing the site, I chose New York City and typed in a date two weeks in advance. Up popped 16 candidates, from midtown’s GEM Hudson Yard ($65 for five hours) to the Financial District’s swanky Gild Hall ($159 for five hours). Guests pay the hotel directly at check in, and taxes (about 14 percent in New York) are added. Besides New York, Hotels by Day is up and running in Chicago, Philadelphia, Washington, D.C., Los Angeles, Miami, Fort Lauderdale and Atlanta, with San Francisco, Boston and Charlotte set to come on board soon. So far Moati says the big day stay success is the Renaissance Fort Lauderdale Cruise Port. Located steps from the docks, its $95 rooms available from 11 a.m. to 5 p.m. mean cruising passengers can tack a daycation onto the vacation. More pool time before boarding the ship or flying home, in other words. It’s going to be fascinating to see how far this goes. Among the things I had never thought of . . . I agree. It’s definitely a new niche. Thanks, John. Wow! From Asia, I associate day stays or by the hour with prostitution – but how fascinating there’s a market for cruisers and layovers, too. Day stays are definitely moving up market. Thanks,Theodora. Smart of them. I can’t tell you how many times we get somewhere early, I’m so exhausted, and feel like passing out in the lobby. Genius! It will definitely be interesting to see how day stays catch on. Thanks, Jessie. I love this idea especially for long layovers. We’ve actually booked day rooms several times in the past. I’m glad to learn that more hotels will be offering this option.